In the early 2000’s Stamford’s West Side neighborhood began to undergo a major transformation. This era began with the redevelopment, by Charter Oak Communities (COC), formerly The Stamford Housing Authority, of aging, obsolete public housing projects into beautiful new mixed-income communities and continued with the redevelopment of Stamford Hospital into a state-of-the-art regional medical center. As these two organizations developed a shared mission to address the existing health disparities from a holistic perspective, they created the Vita Health & Wellness District. Thus, the dream to combine well- functioning mixed-income housing with exceptional healthcare and a thriving business community became reality. Charter Oak Communities expanded upon its innovative approach to community development by seeking to develop public green space in the neighborhood. In 2011, COC purchased five derelict properties, which stood on nearly an acre of land, including a house noted for illicit drug activity. This revealed a perfect opportunity to not only create green space, but also to establish a safe place where residents could work together, learn together, celebrate together and even share a meal together. Most importantly, it was the chance to cultivate a cohesive community atmosphere. Thus, Fairgate Farm was formed. The lot was cleared, abandoned cars, tires, window frames and litter of all sorts were removed and the soil was tested. Over one thousand tons of new topsoil were brought in from eastern Connecticut to be combined with organically rich compost, fruit trees and a few starter vegetable plants. To our pleasant surprise, value of this new farm became clear when neighbors began to bring in fig trees and grape vine cuttings from their personal vines. Although Fairgate Farm started small, today this acknowledged “heart of the West Side” yields over 5,000 pounds and more than 150 varieties of organic fruits, vegetables, herbs and flowers every year. Fairgate Farm has become more than a communal farm. It is a vital centerpiece of the neighborhood. Volunteers from all parts of Stamford come together under the guidance of Farm Manager Pete Novajosky to plant, maintain and harvest a wide range of fruits and vegetables reflecting the rich cultural diversity of this vibrant district. 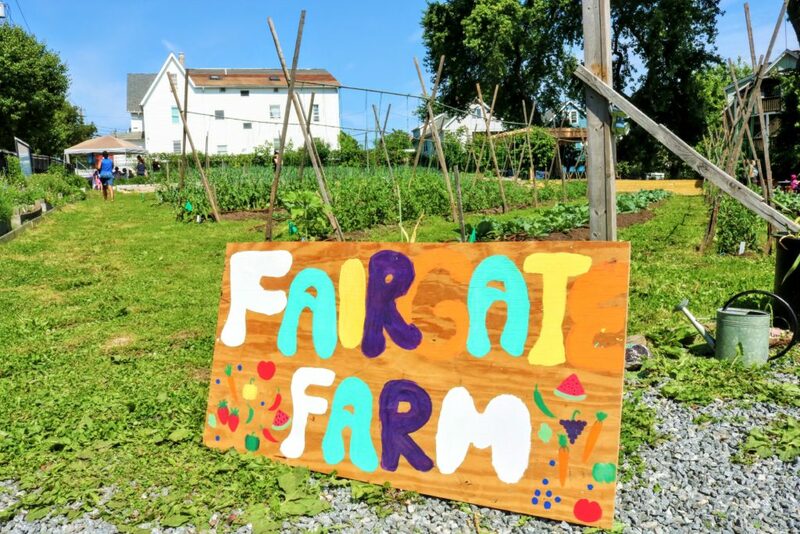 In addition, the Farm provides educational opportunities to young people from our local schools and the Stamford Boys & Girls Club as well as to anyone who has an interest in gardening, composting and healthy sustainable living. Our harvested produce goes directly back into the community with over one-third donated to local hunger-relief agencies while the remainder is enjoyed by our volunteers and our farm stand patrons.